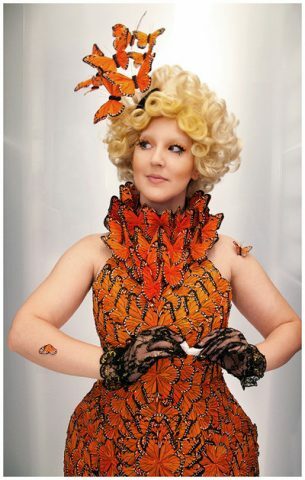 The Hunger Games Effie Trinket Cosplay « Adafruit Industries – Makers, hackers, artists, designers and engineers! I started with a mock turtleneck dress pattern, which I altered to include the extra-wide hips. I was initially a little paranoid that the hips wouldn’t maintain their shape, but between the crisp suiting fabric and the adhesive from the butterflies, the dress turned out solid as a rock. (Fun Fact: The dress can actually stand up on its own; it’s that stiff.) Since I fly to most conventions, the collar piece is detachable so that I can more easily transport the dimensional butterflies. Speaking of butterflies, over 300 artificial butterflies were dissected for the dress alone, giving it the definitive title of “Most Expensive and Just Plain Ridiculous Garment I’ve Ever Made.” The butterfly design was initially daunting, but once I started gluing, I couldn’t stop.